Safety goggles! Avoid touching the reagents or the reaction mixture, aniline can cause cancer! One adds about 0.5 ml water and then adds 3 drops aniline. 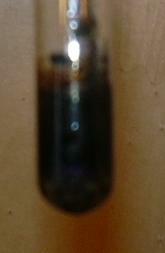 Now one adds about 0.3 ml of the dichromate solution and sways the tube carefully back and forth. Within a few seconds a blue-black color arises which then rapidly becomes darker. The residues can be disposed of as halogen-free organic waste. The dye residues can be largely removed with acetone or the like and a brush (caution! ).